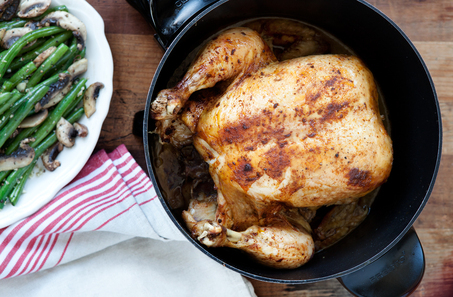 Cooking a whole chicken is not only economical but more nutritious! When you cook meat low and slow, with the bones attached, the meat absorbs minerals like calcium and magnesium from the bones, collagen from the cartilage and gelatin from the tendons. It's like enjoying a favorite album as a whole instead of each song separately. 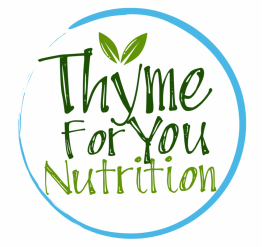 3 tablespoons combined of your favorite dried herbs/spices: thyme, sage, oregano, dill, parsley, paprika, pepper, rosemary, allspice, basil, chili powder, etc. 2. Roughly chop onion and place in bottom of slow cooker. 3. Combine herbs and spices in a small bowl and gently rub on chicken. 4. Place chicken in slow-cooker stoneware on top of onions, set to “low” and cook for 6-8 hours. *Slow-cookers vary. Be sure not to overcook, bones will begin to disintegrate. 5. Once meat has reached an internal temperature of at least 165F, remove from slow-cooker and let rest. Carve out breast, legs, thighs, etc. 6. Once the majority of meat has been separated from the carcass, either place directly in a stock pot to make bone broth (see bone broth recipe) or store in freezer for later use. -If you don't have a slow-cooker, simply roast in the oven in a cast-iron or oven-proof skillet at 425F for 15 min (for a nice sear), then reduce to 375F for about 1 hour. -For a savory bird, choose spices such as thyme, sage and basil. -For a bird with Latin flare, use chili powder, smoked paprika and cumin.